In the late 90s, Ben Greiner recognized a need for technical support among creative professionals in the Chicago area. His one-on-one service and technical consultation was very popular with independent artists and small creative agencies who did not have in-house technical management. Ben’s services allowed his clients to focus on being creative and to forget computers, so he named his shop just that—Forget Computers. Besides the size of his clients, their use of Mac hardware meant they didn’t have many service options. “You hardly ever see articles about Mac-based managed service providers,” Ben said. So with a busy phone and a full schedule of house calls, Forget Computers met a very obvious need. But for Ben, he had a clear problem—how could Forget Computers grow and still maintain the integrity of such a personal level of service? Forget Computers is now a team of six specialists, and they manage over 70 clients, totaling about 600 machines. All signs point to more aggressive growth for the company. Before Jamf Pro was in place at Forget Computers, Ben and his team struggled to maintain a reasonable schedule. Many of the machines serviced by Forget Computers are laptops, and scheduling them to be in one place for maintenance and updates defeated the advantage of their portability. Jamf Pro’s remote management tools allow Forget Computers to execute effective absentee service. The Self Service software portal enables creative professionals to fetch software updates when they need it, and keeps Ben and his team from requiring these clients to be at a specific place at a certain time. With client locations that range from one user to as many as 50, Forget Computers heavily utilizes Jamf Pro’s “awesome” policy-based deployment and asset management tools. 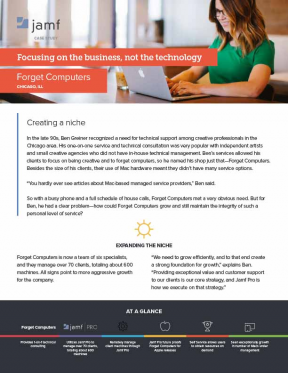 Jamf Pro enables Forget Computers to execute their core strategy, but Ben has also recognized ways to expand his service offerings. By applying their unique brand of service, Ben’s team creates new ways for their clients to forget computers—like reducing energy costs. As the functionality of Jamf Pro has grown, it means more to Forget Computers than new management tools. “We really can present these as new exciting options for our clients,” said Ben. In a market where Mac-based managed service providers are rare, clients find the offerings from Forget Computers exciting indeed. In a much-needed market niche, Jamf Pro allows Forget Computers to operate with the high degree of service integrity and attention to its customers that Ben Greiner has come to call business as usual.